If you suspect that your covered DrayTek product has developed a fault, our experienced support technicians will help you to diagnose the problem and determine whether the unit needs to be service of replaced. If it does, a replacement unit will be sent out the same day for delivery on the next working/business day (to most of the UK). If you wish to take the unit yourself to the service centre (currently North of London), replacement or diagnosis/repair can be carried our in person. With VigorCare, you also have the benefit of an extention to a full 3-years of warranty so that if a fault does develop, you will have no bills for parts, labour or replacement in the event that a warranty fault develops. We’re proud of the reliability that DrayTek products achieve but however unlikely a problem might be, if your business depends on your DrayTek product, VigorCare should give you the peace of mind and convenience that you need. VigorCare subscription can be purchased through your DrayTek dealer. To select the appropriate subscription pack, click on the ‘specification’ tab above to find the right category for your product. VigorCare membership is subject to the VigorCare Terms & Conditions (see terms tab, above) and must be taken out within 30 days of purchase of your new router. VigorCare subscription is available for several categories of product. Determine the correct pack for your product below. You can purchase your subscription from your dealer which must be activated via the link below within 30 days of your router being purchased. If you have purchased a VigorCare Service Pack, you must register immediately to activate it. *Next day delivery is available to most of the mainland UK, excluding the Scottish Highlands and some other more remote areas. VigorCare is also available toremote areas and users in the Channel Islands, Northern Ireland, Republic of Ireland (Eire) and the Isle of Man, however a delivery surcharge or longer transit time may apply for advanced replacements. Your VigorCare membership number (registration code) must be stated in all communication with the service centre for all VigorCare service. VigorCare™ membership must be purchased and registered within 30 days of purchase of your product. Proof of purchase, in the form of a copy of your original sales invoice may be required in the case of any service request or at registration time. If you purchase a VigorCare registration pack but fail to register it within 30 days of your product's purchase, your registration will not be accepted and you will not have the benefits of Vigorcare. If you send us a backup file for your replacement unit, backup files must be sent to us in encrypted form, for example a ZIP archive with password protection. Do not include the password in the email. Next-day advanced replacement service is available to most of the mainland UK, excluding the highlands of Scotland. Delivery costs and service times to other areas may be charged additionally. 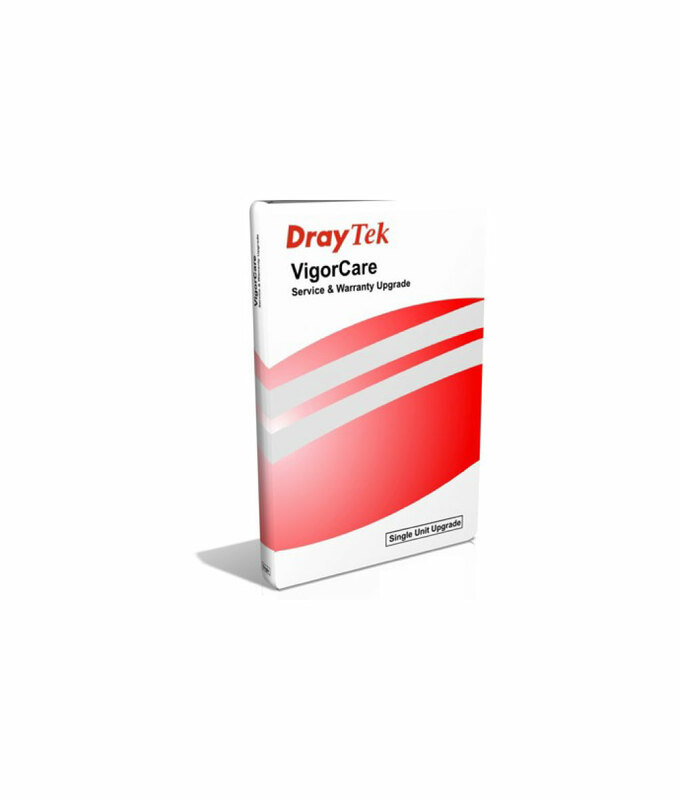 VigorCare is available to the original purchaser of new equipment only; it is non-transferrable and applies to new, official UK channel products purchased through DrayTek Authorised dealers in the UK/Ireland only. When you register for VigorCare, you must provide full details of the owner as registrant. A third party (such as your dealer/supplier) may complete the VigorCare registration on your behalf but they must enter your details into the registration, not their own, otherwise service will not be available to you or to your location. If a third party does complete the registration on your behalf, it is their responsibility to enter your details and those of your product correctly. If you move location (change address), you should notify the VigorCare service team so that your details can be updated. Service will then be available at your new location, provided ownership and usage is still by the original registrant. If you wish to travel to the service centre instead of having the replacement unit delivered, this must be arranged/agreed in advance. If you do attend in person, it may be possible to diagnose/repair your unit or replace it while you wait, otherwise you will receive a replacement unit. Please call first to make an appointment if you prefer to visit in person. The service centre normally aim to dispatch the same day if the request is received by 2pm (or later), and delivery target is the next working day (exc. weekend and bank holidays) however this cannot be guaranteed. The replacement unit will be the same model and may be new or refurbished. If the same model is not available, a model of equivalent or higher functionality may be supplied at the service centre's option. If a different model is necessary, we will assist with configuration however your previous backups will not be restorable. When returning a faulty product, you should retain any expansion modules, power supplies, accessories and cables; only the main unit will be replaced unless other components are suspected as faulty. The manufacturer's original warranty continues to run from the date of original purchase, concurrently with VigorCare. You must return the faulty unit to the service centre, carriage paid and using a suitable insured carriage method, within 7 days of receipt of the replacement unit, otherwise the replacement unit is fully chargeable at current retail price, plus VAT. A Security deposit may be required (normally by credit/debit card) for the replacement unit. This is refundable in full after the faulty unit is received back in the expected condition by the service centre. VigorCare support covers unexpected failure of your product and does not cover faults which existed in the product before registration or inherrent product faults. The membership fee for VigorCare pays for registration for 3 years from the time of your original product purchase. VigorCare is not an underwritten insurance policy; it is an enhanced support service, with a membership fee. VigorCare service is provided by Bonus Ltd, UK Company no. 4416864. VigorCare does not provide on-site installation services; you will need to re-install the product yourself or arrange for your systems people to do this. If your product fails, you may lose any data, settings or other information stored in it; it is always the customer's responsibility to keep up-to-date backups. VigorCare members will receive periodic DrayTek UK newsletters; you can opt-out of those by clicking the unsubscribe link at the foot of any such email. VigorCare and your original manufacturer's warranty does not cover damage or failure caused by factors which are not covered by the standard warranty (for example, fire, flood or lightening damage) or other physical damage/trauma or any use of the product other than that for which it is intended. In such instances, however, the service centre may be able to assist in supplying a replacement unit promptly and pre-configuring it is we have the config file. It shall be the user's responsibility to transfer service subscriptions from old to replacement products (e.g. content filtering); you must inform us when arranging service that the failed unit has live subscriptions in order that they are retained. Any deliberate attempt to obtain VigorCare service for a product not covered by VigorCare, where the cover is invalid or if you deliberately mis-describe a fault, circumstances or condition is criminal fraud and will be treated as such. If the item returned under VigorCare is not the unit covered by your Vigorcare membership, the full cost of the advance replacement unit is chargeable in full and non-refundable. You will also be liable for all other costs incurred for the invalid claim (such as carriage). The service offering of VigorCare is subject to change at any time without notice, with new features/services be added or existing facilities discontinued. The service available to you will be that in force at the time of your original registration. These Terms and Conditions are subject to change or clarification at any time, reasonably, during your membership.